"We hired Kaya as a post-partum doula when our second child arrived. We could not be more pleased with her knowledge, commitment and love during this time. We initially hired her for the first 6 weeks, but she continued to be our "rock" for months following the birth. I had a two year old at the time, and with the new addition to the family, we needed lots of help because both of our families live out of town. Kaya filled this void by being flexible with our changing needs, staying overnight, working on weekends, keeping up with the housework and cooking several meals (she is a great cook!). Kaya immediately bonded with my first child which was a huge stress relief. Even with my second baby, I had so many questions and concerns. Kaya has the experience necessary to alleviate these concerns. You can see her passion for babies and children. She has truly became an invaluable part of my support network." - B.D. Second time mother. "Kaya walked into our Duncan rental home (we are from Tofino and had to move to Duncan for the birth of our son) and immediately lit up our living room. We recently lost my sister tragically and so we were grieving her loss as well as taking care of our 2 year old daughter Hannah- things were hectic to say the least! Kaya's presence immediately brightened our evening. Her energy was amazing with us and she dealt with the news of our tragedy like a professional. She understood that we needed as much support as possible during the challenging time. She engaged our 2 year old daughter Hannah immediately as well as provided us with an information package and a gift bag for me which included beautiful picture cards with positive birthing affirmations on them. She offered to meet with us as many times as we wanted before the birth as well as provide postpartum care. Her approach was warm, kind, and professional. The true highlight of our time with Kaya came postpartum. I was healing from stitches and in a lot of pain. We called Kaya and asked if she could help us for a couple of days (which turned into 4) with Hannah as a nanny. She somehow squeezed us into her schedule and took Hannah out with her on many walks and park adventures. Hannah LOVED Kaya and still asks about her. The bond that they shared, in such a short time, is a testament to what a wonderful person Kaya truly is." - K.J. Second time mother. "Both my husband and I connected with Kaya immediately when she came for our first prenatal visit. She is an amazingly kind person and we can't imagine not having her with us on our journey into parenthood. She was incredibly supportive both prenatal and postpartum, especially when we were told we could not have a home birth because our baby was breech. She is extremely knowledgeable and was able to answer all our questions even at 4 in the morning. She had so many tricks up her sleeve, for myself, my husband and our little one, for everything from back pain to a gassy baby. I believe I was able to make the transition into motherhood much smoother because of her encouragement and support postpartum. She helped with cleaning the kitchen (I don't think our sink had ever been so clean! ), vacuuming, laundry and cooking plus took care of my daughter so I was able to get some much needed sleep. I'm hoping, for our next baby, I will be able to have a VBAC because I know the delivery will be more manageable with her by my side and with my husband for support. I would highly recommend Kaya as a Doula to everyone because she makes the birthing experience just that much better. Overall she is just a good person that anyone is fortunate to have present in their life." - M.S. First time mother. "I am a single mother and lacked the support of a partner, so I decided to have a doula for support. I knew I didn't want some one who was judgemental, I wanted someone who was down to earth. When I met her I knew she was the one for me. Her manner and the practical advice she gave me made an enormous difference to how I felt both emotionally and physically through my pregnancy and my birth. I recommend Kaya, for anyone looking for a great supportive doula, who truly listen's to you, and your wishes." - A.K. First time mother. "I had a very long labor with my first daughter and was so happy to have Kaya by my side. She kept me calm and reminded me of my birth plan when I was losing focus. She was beside me for the entire three days I was in labor and was by my side when I was trying to breastfeed after she was born. She helped my husband support me by giving him tips and tricks to use to keep me focused. I had the natural birth I wanted because I knew she could help me work through the pain using massage and encouragement." - W.B. First time mother. ​"Her knowledge and empathy during my labor was just what I needed! She was able to help me work through my emotions during my natural birth when it turned into an emergency c-section." - L.P. Second time mother. "Kaya came with me to my doctor's appointments and helped me learn about what was going to happen. I appreciated her having my back and knowing she was there to help me when I needed when I was pregnant and when I was in labor. She helped me learn how to breastfeed my son afterwords and even spent the night with us so I could have the help I needed to make sure he was doing it properly." - M.K. First time mother. "I was impressed by how she was able to include my husband. She gave him tips on how to help me through my contractions and she helped him understand what was happening. I recommend having her as your doula for your benefit AND your partner's." - W.I. Second time mother; First time father. ​"As a family with new twins we desperately needed sleep!!!! She came and took over our duties for the night and gave us the fresh start in the morning we needed!" - J.N. First time father to twins. ​"I had a hospital birth with my daughter and Kaya was my amazing doula! She helped me get ready when I was pregnant and feel like I could handle labor and birth. She came to my house when I was in labor and came with us to the hospital when I was ready. She made my husband feel good too because she kept reminding him of the tricks to help me relax and he got to sleep because she was with me so I wasn't ever alone. She stayed overnight with me in the hospital and helped me nurse my daughter so when we got to go home the next day we felt good leaving and not scared. She came over a couple times more after we were home and made dinners to freeze and helped me nurse when we had a few problems. I was really scared to get depression because I've had it before but she helped me feel good about being a mom and helped my husband help me and keep it in control. We are definitely going to use her as our doula again when we have another!" - N.M. First time mother. I have 3 boys already and never used a doula before. I got pregnant with my 4th unexpectedly but I knew I wanted to have a home birth this time. 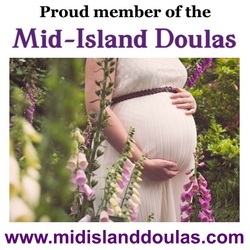 I found great midwives and then found out about doulas. I wanted someone to be my labor support because my husband was going to have to look after our other boys when I was in labor. She came over for 2 prenatal visits and came to one of my appointments to meet my midwives and help me get ready for my homebirth. My other labors were pretty quick and so I was worried she wouldn't make it in time maybe. She came 20 minutes after I told her I was in labor and my baby was born 2 hours after! She kept me calm when I felt like I lost control and things were happening too fast. She also helped take some wonderful pictures of my other kids meeting their new brother and my husband and I. She has come over again 2 more times to check on us and always asks if she can grab some groceries on her way over and makes us at least 1 dinner. I feel really happy with my experience and even though I don't plan on having more kids I recommend her and doulas to all my pregnant friends. - S.R. Fourth time mother.